At Anantara Layan, a 5 star resort Phuket has on offer, guests enjoy access to a quiet beach cove as well as a diversity of attractions within easy reach. Visit the island’s bustling southern beaches, areas famed for their vibrant nightlife, championship golf courses, and fun leisure attractions for every age and interest. Regular flights between Bangkok and Phuket are operated by Thai Airways, Bangkok Airways, Air Asia, Nok Air and Thai Lion Air. In addition, Phuket receives direct flights from a number of international destinations. Please note that Bangkok has two airports - passengers should therefore confirm their airport of departure/arrival when making transfers or arranging pick-ups in Bangkok. Travel in style with Anantara Layan’s limousine transfer. 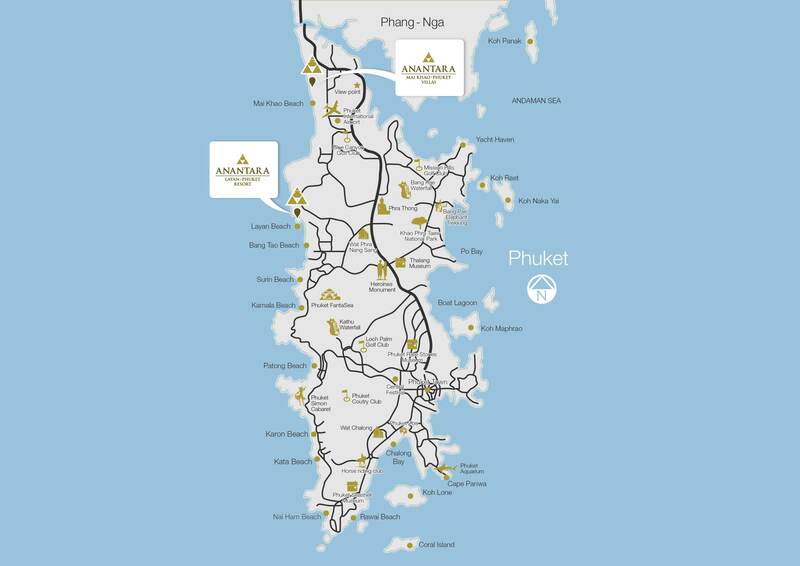 The resort is a smooth 20-minute journey from Phuket International Airport. We also offer VIP airport arrival services, wherein an associate will greet you upon landing, escorting you through immigration, baggage claim and customs and to your waiting limousine. From Phuket International Airport, turn left at Route 4031. Turn right onto Route 4018, and then right again into Layan Road Soi 4.